From specialty pizzas to great ambiance to rich history, these restaurants bring variety to Kettering, Moraine and Oakwood. Pizza, pasta, passion! Those are the three P’s that fuel Figlio Wood Fired Pizza, a gourmet pizza joint that offers far more than the average slice of pepperoni. The owners, Peter and Laurie Danis, met at law school and later decided to leave their jobs as lawyers to pursue their passion for making delicious meals. Peter explains that Figlio, which opened in 2003, is a wood fired pizza restaurant and utilizes a style of cooking that has existed for thousands of years. The cooking is done strictly with wood and there is no gas in the oven. 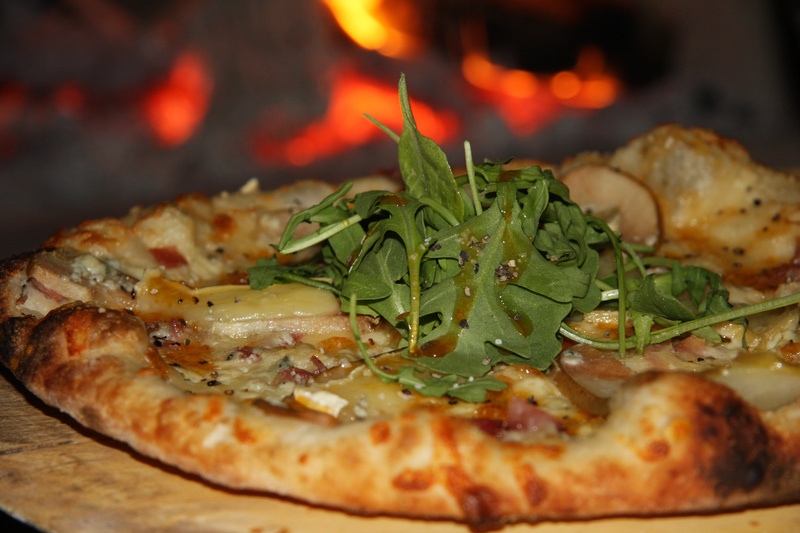 Wood cooks at a higher temperature so the pizza can be cooked very quickly. Aside from the wood fire oven, the pizzas stand out due to their unique toppings from all over the globe. Peter and Laurie travel around the world and bring back rare flavors to incorporate into dishes. He says that while the signature dishes are pizza, the menu has a lot of diversity. “We have a hugely popular pasta, Chicken Diablo, which has a very unique sauce. It’s a cream sauce with a little touch of heat and fresh vegetables as well. We also do a salmon dish that’s very popular,” explains Peter. Peter says that he and Laurie view a pizza crust or a bowl of pasta noodles as a palette from which to paint. They’ve recently added gluten-free options to the menu and are working on dessert pizzas that have a chocolate crust and toppings such as mascarpone, ice cream and banana split. Treasure Island Supper Club has been a local favorite since 1961 and attracts big groups to its banquet hall for casual and business get-togethers. It’s a place where customers can get excellent food, have access to a full bar and experience a great atmosphere. Zechar explains that the restaurant has been a local staple for years. For a long time, General Motors was across the street and was a big source of income for the restaurant. Zechar adds that all the furniture in Treasure Island adds to the appealing ambiance. “The tables are handmade. Everything is hand-carved and handmade. We have a low bar and padded leather bar seats that roll up to the bar. That’s something that’s unique,” she says. Flyboy’s Deli is named after the fathers of flight — the Wright Brothers, of course — who happened to have originated from the area, where the Oakwood restaurant is located. The New York-style deli strives to keep the innovative spirit of the Wright Brothers alive with their menu. For example, he says that “The Yo-Yo” Pastrami, named after the yo-yo (a Dayton invention), is a popular menu item. Crandall also says he wanted to bring a bit of the East Coast to Dayton. The menu items start with a New York-style flavor for the sandwiches. He then tries to combine that with some aspect of Dayton. In addition to the homage to Dayton and New York, the restaurant also celebrates history. It focuses on WWI and WWII with a mural upstairs in the aviation hall. “All the pictures that we’ve got on the second floor have been submitted by the community,” Crandall says. While the food is number one, he says he has a lot of customers come in, see a picture of an event and say they were either at it or know someone who was at it.